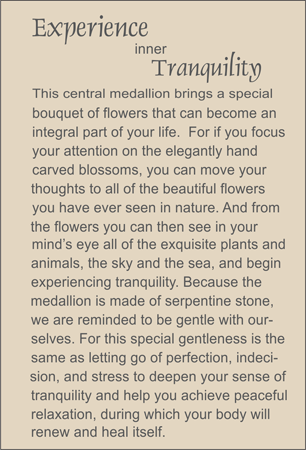 Tranquility is the sentiment expressed by this flowering plant medallion which has been hand carved from carnelian stone. For it is by turning to nature that we can best find peace and tranquility. This medallion is suspended from a necklace of rust-colored freshwater cultured pearls inset with two triplets of carnelian tumbled nuggets. Faceted amethyst ellipses provide punctuation. Sterling silver toggle clasp.